Cambodia's UN-backed war crimes tribunal has indicted four former Khmer Rouge leaders. Nuon Chea, deputy to Khmer Rouge leader Pol Pot, will stand trial next year, along with former head of state Khieu Samphan, former Foreign Minister Ieng Sary and his wife Ieng Thirith. They are accused of genocide, torture and religious persecution. In July, former prison chief Duch was found guilty of crimes against humanity. He was the first person to be convicted by the Phnom Penh-based court. The trial of these four leaders, who have been in detention since 2007, is expected to start by the middle of 2011, the tribunal said. All four are now elderly, with 84-year-old Ieng Sary in bad health. His 78-year-old wife, who was the Khmer Rouge's social affairs minister, will be the first woman to face the tribunal. 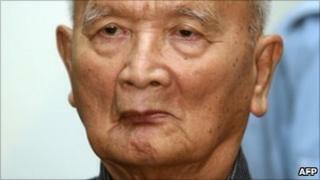 Nuon Chea, who is also 84, was "Brother Number Two" behind Pol Pot. Some experts believe he was the ideological driving force behind the regime and responsible for its most radical policies. Khieu Samphan, who is now 79, was one of the isolationist regime's few points of contact with the outside world. All four reject the charges against them. But between them, says the BBC's Guy De Launey in Phnom Penh, they should be able to provide the answers to the questions which have puzzled Cambodians for decades - why did the Khmer Rouge enforce policies which resulted in the deaths of so many people? Up to two million people died under the Khmer Rouge, which ruled Cambodia from 1975-1979.
Who were the Khmer Rouge? Policies included the evacuation of cities, forced labour in the rice fields and the summary execution of those considered enemies of the revolution. The group's top leader, "Brother Number One" Pol Pot, died in 1998. Duch - the first person to be convicted by the tribunal - ran Tuol Sleng prison, where "enemies" of the Khmer Rouge regime were sent. He admitted overseeing the torture and execution of thousands of men, women and children at the prison and was sentenced to 35 years in prison. This was reduced by 16 years for time already served and because he had been held illegally.